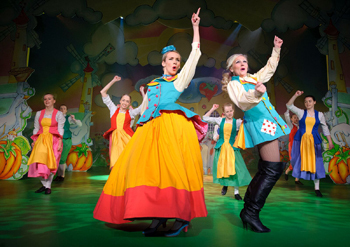 Having decided which of the stalwart panto themes they wanted to produce, Oldham Coliseum had the task of ensuring that audiences would be guaranteed a fine time. The logical step was to engage Fine Time Fontayne to both co-write and star in ‘Mother Goose’. With twenty previous pantomimes already penned, Fine Time clearly knows a thing or two about turning a wafer-thin plot, with a bevy of even thinner characters, into two hours of non-stop, entertaining slick entertainment. Coupled with resident artistic director Kevin Shaw, who recently revived the superb ‘Hot Stuff’ at the Coliseum, the result is a traditional, family pantomime which, without breaking any boundaries, keeps everyone entertained with enjoyably outrageous over-acting, tight comedy routines, energetic singing and an impressive dance troupe. The cast work well together, completely at ease with each other's antics whilst being held together by an indefatigable Mother Goose, played by Fine Time with all the authority of a circus ringmaster. The only disappointment for me was that villain of the piece, the Demon of Discontent, whilst nicely portrayed by Andonis Anthony with the silky demeanour of a lounge lizard, does not for the most part have much to do apart from introducing each act and then having verbal exchanges with the good fairy, played by Kaitlin Howard. A truly amusing performance was given by Simeon Truby as Squire Grabbit, who would not look out of place in an episode of the Black Adder. 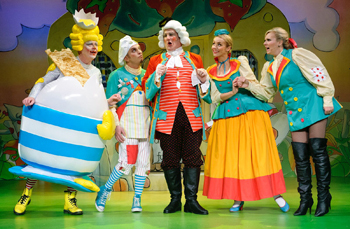 Nicole Evans was well cast as his daughter Colinette, bringing an air of virtual normality in contrast to the eccentricities of Mother Goose, whilst Richard J Fletcher as Billy Goose and Justine Elizabeth Bailey, the principle boy, as Colin Goose both provide excellent support as the brothers who work with the Squire and his daughter. Mention must be made of the fact that this production of ‘Mother Goose’ is very much a visual, indeed technicolour, experience with a dazzling display of bright, frequently-changing costumes backed by a wide range of colourful scenes; I lost count in particular of the times Fine Time kept returning to the stage in a different outfits! The overall effect is a well contained world of stage fantasy which never takes itself very seriously, with fourth wall being continuously broken. Also, the music, provided by a tight trio, is very well blended into the action without any clumsy attempts to find excuses to introduce a song. A nice added touch is the wide range of genres from which the songs have been selected, including modern pop, 1940’s musicals and 80’s rock. There was a genuine sense at the opening night that all the cast were already really enjoying singing and acting amidst the non-stop mayhem and if you’re looking for a fun night out for the family over the coming festive season, ‘Mother Goose’ at Oldham Coliseum ticks all the boxes.